Join the rest of the industry in using EnergyLink for a more effective, efficient and economical way to process JIBs. 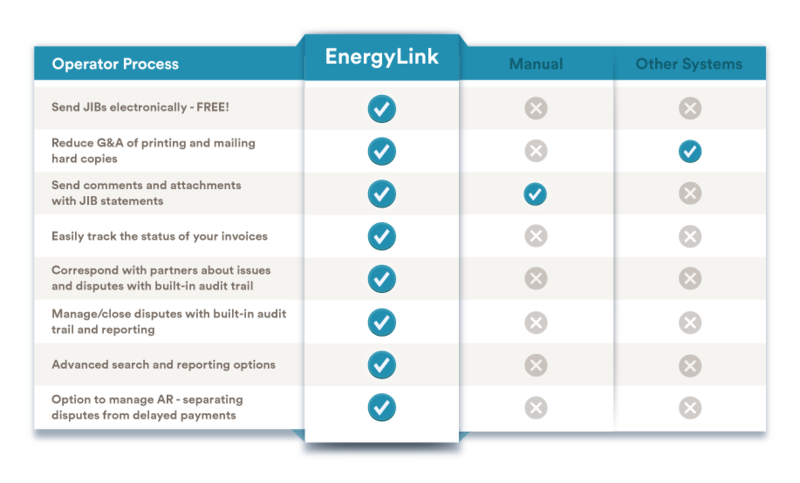 EnergyLink seamlessly interfaces with nearly all industry accounting systems. Create journal vouchers customized for easy upload - no data manipulation needed! In 2000, Talisman began to search for a tool to easily reconcile, reduce, maintain and report partner receivables. We ended up being the pilot client for the EnergyLink AR Subledger Module and have never turned back, it is heaven! I am a huge fan of AR Subledger with my 15+ years of industry experience; my staff and I are handicapped without it. I can say with confidence, "Try it, you won’t regret it!" We have been using EnergyLink since August 2002. We were one of their first customers in the United States. Their Customer Service is excellent, and they’ve always been very helpful when I’ve had to call them. The JIB Operated & Non-Operated features are easy to learn, and once your cross-reference tables have been built, it reduces the time needed to process a Non-Operated JIB for payment. The ability to dispute costs on a Non-Operated well on a line-by-line basis, or by well, is a nice feature. When you dispute charges, EnergyLink sends the Operator a message, so that a resolution can be reached sooner rather than later. All in all, good systems, with good customer support. Over the years with the use of EnergyLink, our jobs have become easier and less time consuming so that we can focus on other aspects of our jobs. It is really great to see more and more companies putting their Road Use, Mineral and Surface Rental invoices on EnergyLink as this makes our jobs even easier for processing, approvals, disputes and collection. Red Dog has been a great partner to work with in regards to making sure that our needs were met when we went to a new upgraded system to ensure we had no issues with our downloads from EnergyLink to our new system. Red Dog is always looking for ways to upgrade their programs to meet the needs of their clients. Great job Red Dog. My experience with the Red Dog Systems support team has been fantastic! The work quality, friendliness of the support team, and professionalism is outstanding. I really appreciate all the support I have received and I’m always excited to see changes made in EnergyLink!